Rivers State Governor, Nyesom Ezenwo Wike has called on Acting President Yemi Osinbajo to sack the Acting Chairman of the EFCC, Mr Ibrahim Magu for overthrowing the Governments of Benue and Akwa Ibom States . 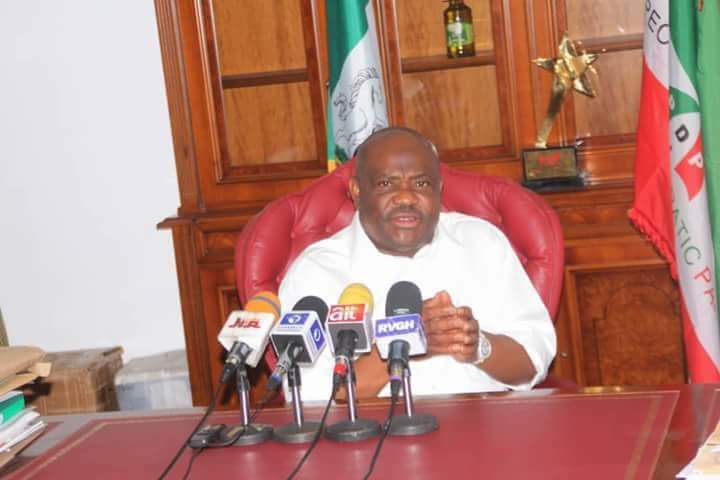 In an interview with journalists on Thursday at the Government House Port Harcourt, Governor Wike said the freezing of the accounts of the two states is more grievous than the invasion of the National Assembly by the sacked Director General of DSS. He stated that the unconstitutional freezing of the accounts of the two states is tantamount to the closure of the Executive, Legislature and Judiciary of the two two states. “I am calling for the sack of the Acting Chairman of the EFCC, Mr Ibrahim Magu for overthrowing a tier government. The mere fact that the two accounts have been re-opened does not mean that a crime was not committed. “When you freeze the account of the State Government, you have overthrown that government. Without funds, a state cannot function. This means the shutdown of government business at Executive, Legislature and Judiciary in the affected states”. The governor said that the impunity of the EFCC can no longer be overlooked because it has the capacity to destroy democracy. He said the condemnation of the EFCC illegality by the Chairman of the Nigeria Governors Forum is not enough, noting that the Governors Forum must stand up to defend the independence of states as the second tier of government. Governor Wike also called for the prosecution of Ibrahim Magu, saying if the Director General of DSS can be sacked for overthrowing just one arm of Federal Government, then Magu should be sacked. “It disheartens some of us to see the inconsistency of this government. This particular agency thrives on impunity. It disobeys court orders at will and on reckless anti-democratic actions. This impunity must stop”. Governor Wike said when the Benue State Governor, Dr Samuel Ortom was still in the APC, the State Government accounts were never frozen. He said the action was because he defected. He also traced the Freezing of Akwa Ibom State Government Accounts to defection of the Former Senate Minority Leader. The governor said that the ultimate target of the APC Federal Government was Rivers State where the EFCC has been using the EFCC to perpetrate illegality. Commenting on the defection of the Former Senate Minority Leader, Godswill Akpabio , he said that it is not an important issue because it has not affected the structure of the PDP. He said that at the appropriate time he will speak on the defection which has been brewing for two months. He said that Nigerians will be shocked at what transpired before Akpabio defected. The governor added that there was no need highlighting an issue of no consequence.